West revisit the scene of the Prospect massacre of 2018 this Saturday. Strangely, it kickstarted their season last year, as they defeated Central at Elizabeth the following week. 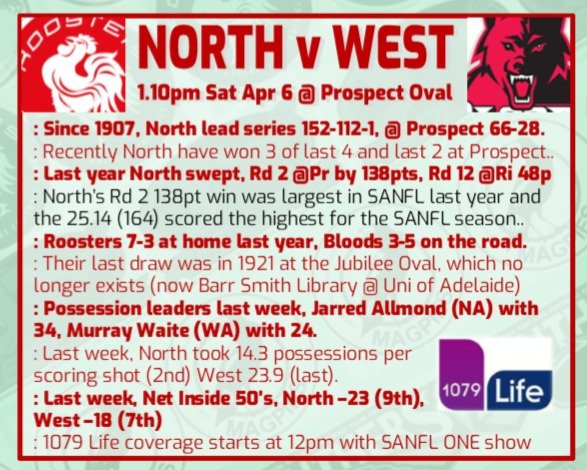 North will start hot favourites after a solid outing at Woodville, while West put up a respectable performance against a strong Port outfit. Although North have lost a fair bit of talent from last year, they're still a very talented side and will look to their quick ball movement to score. West had several stars a bit down last week. Apart from the fact that West have brought in a new rule saying your name has to start with an 'S' if you want to play midfield, all of Schmidt, Snelling, Schiller and Stevens were below their best and will bounce back. The next cult figure in SANFL will be Gibson Turner. An excitement machine, he kicked 3 last week, including one from the boundary on the 50 metre arc. Despite a 5 day turnaround compared to nearly 7 for West, North will fancy their chances here. I agree with you Scrappy. I'll leave my thoughts on North's penalty out of it to avoid yet another 19th man debate, but definitely agree that if there was to be a penalty handed down, then it should have applied in the year in which it was incurred. All clubs margin for error reduces with each loss, but that penalty is distinctly unfair on North imo. Interesting game this one I reckon - North still looked very good in patches against the Eagles and obviously have some class about them, and I liked what I saw from West last season once they began settling in to a new regime. They still have plenty of quality on their list too. 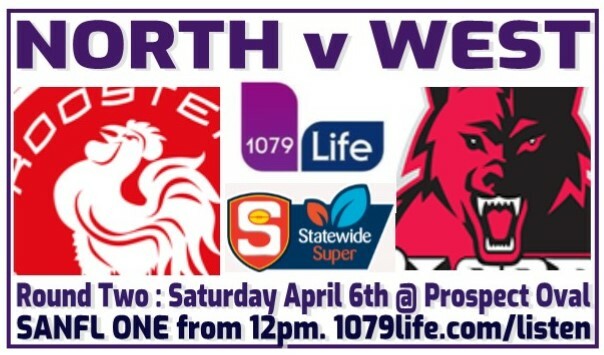 I think North will prevail, but Im certain West won't be ambushed as they were in the corresponding fixture last season. We were disgraceful last year. Can I take this opportunity to publicly thank the President of the North Adelaide Football Club, Lee Virgin, for being kind enough to phone me after my sacking. Lee and his wife and the NAFC were always very good to Jenny and I at their home match lunches, etc and we really enjoyed their company and the hospitality of the NAFC. As for the game, it should be a close contest, but it's always hardto win at Prospect.